My vision of what a macaw companion would be was undergoing radical revision. There was going to be competition with the dogs for their food. There was going to be an ongoing mess: bird food on the floor, dog food on the floor, gallons of water on the floor, and of course prodigious amounts of bird poop. This was not going to be a bird who gazed at me lovingly while she nibbled an almond in silence. I began to realize that for all I had read, for all those discussions at the Parrot Weekend, and for all that I thought I knew, Sarah was not a bigger version of the parakeet we had when I was growing up. 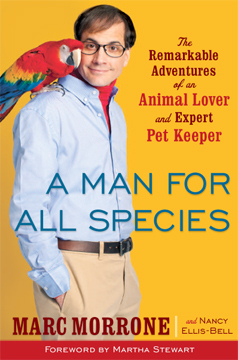 I was back in the Pleistocene Era; I had adopted a raptor. There was also going to be noise, lots of noise. Nearly two feet tall and with a four-foot wingspan, Peg Leg was a daunting creature. Her life in the Amazon basin had ended when her captors had to cut off her left foot to release her from their nets. In captivity since the age of two, she had not flown or bathed in several years. Now she was a vicious bird, trying to bite whoever fed her or tried to touch her. But Nancy Ellis-Bell saw none of this. She saw a beautiful bird with a broken spirit, one who deserved to live as she once did, happy and free and with owners who respected her. 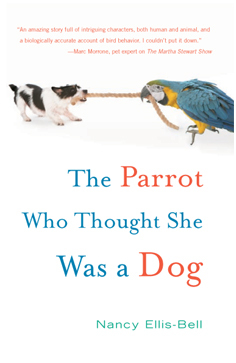 In THE PARROT WHO THOUGHT SHE WAS A DOG (Three Rivers Press; Publication Date: July 28, 2009), Ellis-Bell recounts the heartwarming story of how her family was turned upside down by a smart-mouthed, dog-food-stealing, furniture-chewing, and utterly loveable blue-and-gold macaw. Ellis-Bell chose to rename the parrot Sarah, because it stood for princess in Hebrew. 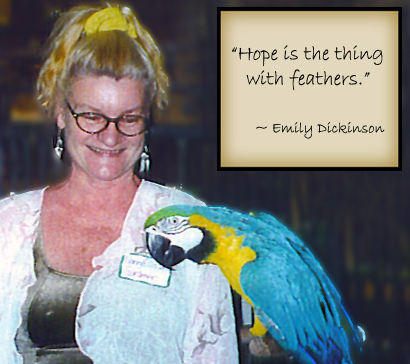 Over and over she would repeat the words, “Hello, Sarah; you are such a beautiful bird,” rhythmically erasing the terrible sound and memories of the name “Peg Leg.” And with this, the trust between woman and bird slowly began to form. Many owners before her had given up on Sarah, but if there was anyone to rehabilitate this bird, it was Ellis-Bell. 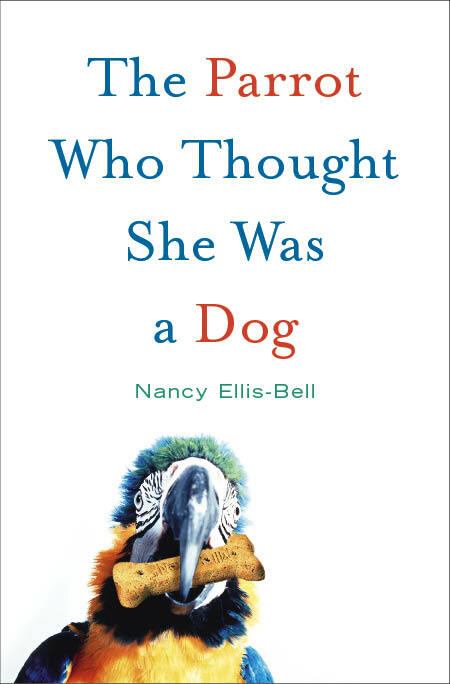 From a very early age, Ellis-Bell had a way of attracting lost animals. When she adopted Sarah, she had no fewer than two dogs, two cats, and even a family of raccoons in her care. But nothing prepared her for the whirlwind experience of having a bird like Sarah. The more comfortable Sarah became with her environment, the more she sought out new challenges. Firmly believing that wild birds should never be kept in cages, Ellis-Bell released Sarah from hers after only a couple weeks. She quickly conquered the living room, the kitchen, and anything else that came her way including the daybed, the dogs’ food and chew bones, their toy basket, and even the underwear drawer! As Sarah continued to spread her wings and explore the house, Ellis-Bell could not keep her indoors any longer. The decision would ultimately change their lives forever, but Sarah’s new life and happiness proves that it could not have happened any other way. THE PARROT WHO THOUGHT SHE WAS A DOG is an unforgettable memoir about one of the most unique animals in the world and about how we love and protect those closest to our hearts. With humor and humility, Ellis-Bell reveals what it’s like to open your heart to new experiences and be ready for what the world, and its inhabitants, has to offer.